The Geotech Colloidal Borescope accurately measures groundwater velocity and direction in real-time. Using proprietary technology, the Colloidal Borescope incorporates a down-well sensor set to depth-specific intervals and a live-view AquaLITE software that captures and records thousands of data points per minute yielding statistically assured preferential flow data. Borescope Probe – fully integrated colloidal view video microscope with magneto-resistive digital compass enclosed in a protective 300 series stainless steel housing. 90-240 VAC, 47 to 63 Hz. 7 Watts. DC Power Requirements* 10 to 16V DC @ <1 amp. The Colloidal Borescope System powered by AquaLITE enables environmental scientists to fully understand the complexity of site hydrology. 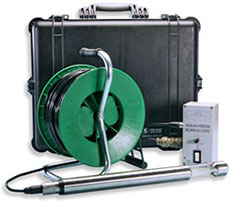 The Colloidal Borescope can measure groundwater direction and velocity in real-time at depth specific intervals. Geotech's AquaLITE software allows the user to view both the live video signal from the borescope and a symbolic representation of particle movements at the same time. The software is fully configurable, to allow for changes in video signal quality, groundwater clarity, and other aquifer characteristics. The software also allows the user to view the sampled data in directional, velocity or combined graphs, all in real-time. The graphs are fully customizable. The graph images, as well as the sampled data can be exported for use in other applications and/or presentations. The software offers a statistical summary report for the user and includes well number, date and data information, general statistical analysis, and a vector analysis. The summary report may be exported for use other applications and/or presentations.